The 2015 Tesla Model S P85D earned the top score in the AAA Green Car Guide, AAA Texas announced today. 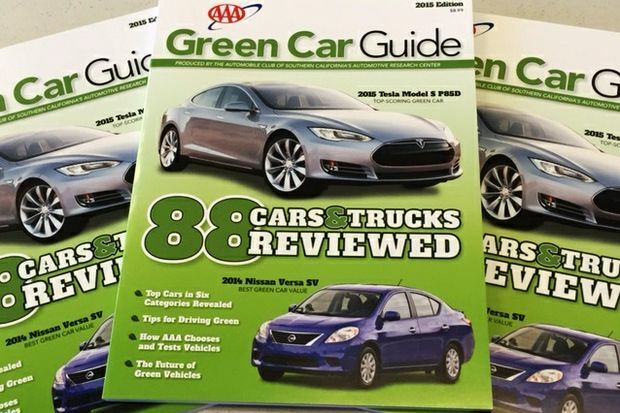 The Palo Alto-based automaker’s car is featured with more than 80 other green vehicles in the 2015 AAA Green Car Guide. The top-scoring and best value green vehicles, along with category winners, were unveiled today inside the motor club’s historic headquarters courtyard. The best green car value award went to the 2014 Nissan Versa SV. To help those in the market for a green car or truck, the 160-page, comprehensive fifth annual AAA guide reviews 88 battery electric vehicles, compressed natural gas-powered (CNG) vehicles, clean diesels, hybrids, partial zero emission vehicles (PZEVs), and vehicles with high fuel economy. These vehicles were tested and scored by the Auto Club’s Automotive Research Center (ARC) in 13 categories (braking, fuel economy, emissions, handling, ride comfort, etc.). The report also contains comprehensive information about green technologies from the ARC evaluators. “The center also has a long-term interest in helping motorists cut their fuel bills and clean the air,” said ARC Manager Megan McKernan. “Green vehicles offer motorists a way to reduce emissions and save fuel, and depending on the choice of green vehicle, can help motorists save cash, especially when gas prices skyrocket. The 2014 Nissan Versa SV tops the 2015 guide list as the best green car value when price is factored in, according to McKernan. “It’s priced under $17,000, averages about 35 miles per gallon and has a spacious interior, making it an affordable fuel-sipping car,” she added. The research center tracks significant changes to a vehicle from model year to model year. If no significant changes were made to the power train in 2015, a prior model year’s results were used. For example, staff tested a 2014 Mazda3 sedan. No significant changes were made to its powertrain in 2015, so the 2014 results were included in the 2015 AAA Green Car Guide. The ARC’s engineers and technicians – who have more than 100 years of combined experience – evaluated the vehicles. Each category was scored on 0-10 points. Scores were totaled to determine top vehicles. Then, each vehicle’s total score was divided by its “as-tested” price to determine its cost per point for best value. The guide lists vehicle specifications, test scores, data and observations in one-page summaries.